I was gone for a few days–no, not mentally, that’s everyday–I mean literally out of town. The kids and I went with my husband to a work conference. We went to San Luis Obispo a few hours south of us. My sister and her kids drove up a couple of hours and stayed at the same hotel. Monday morning we decided to walk around the metropolis of SLO and check out the sights. On our list of things to do was to visit Bubblegum Alley. 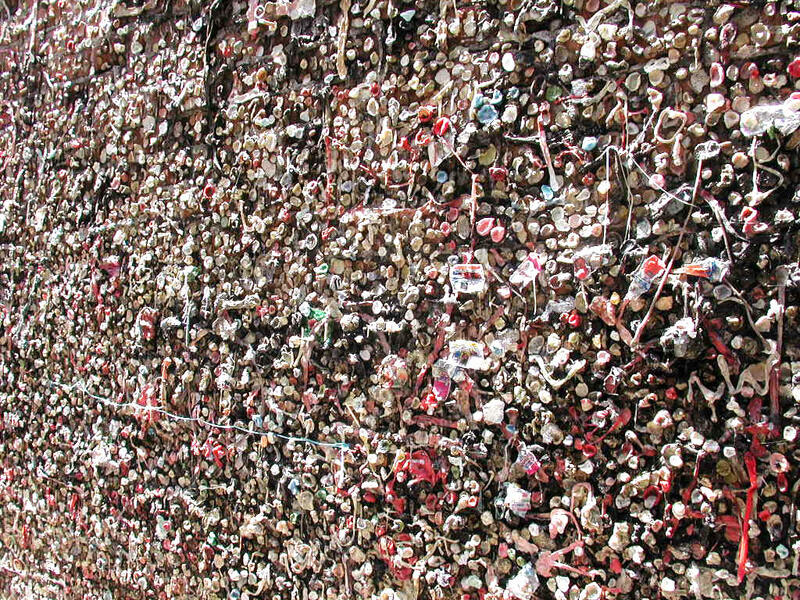 Years, ago some people started to put chewed bubblegum on this wall downtown. At first it was protested by some, but more people kept adding their addition until it became a “sight” on the visitor’s brochure. So we got out our map (SLO is small, we shouldn’t have needed a map but we did) and tried to find this wall of art. After walking for a bit, we decided to ask a serious little man who was walking by for directions. He told us where to find the wall, and remarked how incredibly disgusting that part of San Luis Obispo history was to him. I thought he was being rather narrow-minded–I looked forward to seeing this community art. Now, I need to explain something here. I know it was a wall filled with chewed gum, but I was thinking that the city had added some coloful rocks and maybe finished it off with some high-gloss paint. I thought that a local artist had maybe used it as a beginning canvas and creatively finished the art. I was so wrong. The Bubblegum Alley was a boring ugly wall covered in chewed gum. Not even colorful gum! Most of it was just the grey variety. It was rather repulsive and disappointing. I stayed 20 yards away from the wall at all times, but my sister decided to make the best of it. She made her kids pose in front of the wall as they protested. She thought it would be a good Christmas picture. We continued on our search for culture by visiting the mission, which was closed, and trying to visit the children’s museum which was being renovated until December. We settled for window shopping and tasting the local cuisine. All in all it was a nice day — only nothing could ever compare to the breathtaking view of the saliva mural. By the way, the picture is deceptive–it doesn’t even look half this good in person. And no, I couldn’t bring myself to add to the wall even though my piece of green gum would have given it some needed color. My sister added her piece of pink gum and it brightened the wall so much. We moved into our house 23 days ago and we are almost all unpacked — not because of me. I have spent most of my time wrestling weeds and fighting ants in the backyard. It is very similar to what I normally face as a mother so it seemed a good idea. When we moved in I had great plans for the yard. I had no idea then that it was under the control of the forces of an evil berry bush and half of the ant population. The evil berry bush must be wild blackberry. If the mention of blackberries brings romantic notions of cobblers and pies, just strike that out of your mind. This wild bush is evil, invasive and mean. A few days after we moved into our home I decided to attack the vicious bush. I hacked at it, pulled, wrestled, wacked, chopped and did everything I could–save bringing out the poison to kill that sucker. Finally after my hard work I could look at my yard and smile — I had defeated the beast. No longer did I see blackberry branches popping up all over the yard. I limped into the house, my leg bleeding from the ripped flesh where the bush thorns had stabbed me. Four days ago, I went out into the yard to water. I thought I heard something laughing at me behind my back. The bush had come back all over the yard again. It was laughing and mocking me. I hacked at it, but finally decided to send my husband out there with the pick to attack. After a couple of hours, the bush was again gone from the yard. However, the ants had moved in. Cousins, uncles, grandparents the entire ant family with all their neighbors. They had little suitcases and tents in their arms. They had planned to take over where the bush had left off. I searched on the internet for natural ways to kill ants. The first attempt at murder was with boiling water. I could hear the moans as I scoarched their little bodies. That worked pretty well but they were still fighting back. Next I mixed up a concoction of garlic, soap and water. Ants do not like garlic and they didn’t seem to appreciate their garlic shower and disappeared for a little while. I decided to make my concoction a bit more potent by adding lemon juice, hot sauce, and peppermint oil. I heard the ants scream as I walked toward them with the spray bottle. I sprayed and sprayed all over and again I was the king of the yard. This should last at least a couple of days. No real ants were harmed in the writing of this story. Any resemblance to any real ant, living or dead is purely coincidental. After reading so many writing articles and books, I have discovered that I am suppose to have an inner critic. I read that I must discover the inner critic, find him/her and maybe even name him/her. (Okay the naming part was my addition, but just so I don’t have to write “him/her” — this will make it simpler). My inner critic will be named Beezus. I am to “invite the inner critic to leave”. Okay, this is confusing, first I am to welcome Beezus, give her a hug, and then ask her to leave? Won’t I be sending mixed signals? Finally, I should “make friends with my inner critic.” Okay, after all of this do you really think Beezus wants to be my friend? Apparently, after all of this, Beezus can then become my “inner champion”. An inner champion is great, but what I really need is for her to babysit Friday night. If you notice my title is a-muse-ing. I don’t make the claim to be hilarious. I won’t promise you I’ll have you rolling on the floor in laughter after reading my blog. I might have you rolling on the floor with abdominal pain, but I won’t promise you this either. I will try to amuse you. I want to make you laugh, I hope that you at least smile–even if it’s only on the inside–however, I don’t promise to make you spray out your coffee through your nose. I can’t make those guarantees. How many readers see this button and expect to be more than amused — expect to laugh even? Oh, the pressure. So, I say to myself, do I keep the humor-blogs “society” membership or do I withdraw? Or maybe this button on my blog helps me write better? Or makes me strive to get you to chuckle? Maybe it helps me dig deep into my soul to find one funny nugget that will make you remember that life isn’t all mold and mildew. Or maybe I should clean my bathroom. I avoid words describing produce written on my bottom. I might consider “Not Sagging” or “Still Hanging On” but “Juicy” on a bathing suit bottom — really? Yes, I know it’s a name brand, but keep it on the tag. Even when I was in my 20’s I wouldn’t have wanted “Juicy” on any of my parts. No, call me old-fashioned but I prefer to avoid any labels on my derriere that could be interpreted to be defining the condition of said arse. Carl was a guy I met on the phone this week. Although we didn’t get to know each other well–he did most of the talking and I didn’t get to ask him much. We started talking on Friday the 29th when I needed to find out if my phone was hooked up. At first he seemed very helpful — found out what state I was calling from, asked for my phone number and understood most of my responses. At the end of our one-sided conversation, he informed me that my phone was connected. After checking every phone jack I could find in my house, I realized that Carl had lied to me. I decided to try to go over Carl’s head to Hilda the human voice and she also said my phone was connected as well. “You think you tried every jack in the house or you know you tried every jack in the house”, said Hilda. I called my landlord and on Tuesday the 3rd, he came to the house and checked the main phone interface. The phone line didn’t work. He said that I should do what I needed to do to get it fixed and of course he would pay for it — but he knew the phone company had messed up. I called Carl again. After hearing his speech again (didn’t he remember he told me all that last time) he finally let me talk to Harry the Human. Harry the Human was very friendly and told me that a technician would be coming around on Thursday the 5th. At first I was a bit frustrated that I had to wait until Thursday, and then I remembered that Wednesday was the 4th and the technician should be allowed to eat his red, white and blue jello mold with his family. Thursday the 5th came and I decided I need to make sure the technician was still coming. I talked to Carl again and tried to go over his head by hitting “0” repeatedly. Apparently I got him very upset and he disconnected me. I called again and told him I was very upset with how he was treating me and didn’t want to hear the same speach over and over again! Didn’t he know me? Finally, after playing it Carl’s way I got connected with Hilda the Human II. Hilda II, told me that a technician was still scheduled and would be coming. She then confirmed my cell phone number with me–only it wasn’t my cell phone number. I was worried the technician was calling someone else and going to their house. Hilda II assured me that he hadn’t gone to my house yet and would be there before 7 pm. Thursday at 5:30pm I gave my buddy Carl a ring. I was in no mood to fight with him so I waited while he went through his number and was finally connected with Harry the Human II. Harry broke the news that there was a major outtage in our area and the repairs would be completed by Saturday. I explained that my phone never worked so how did they know if I was part of the outtage. He gave me some explanation about numbers and cables and phone lines and people eating kiwis in New Zealand. Basically he was determined to make sure I had no idea what he was talking about so that I would stop bugging him. I asked him when the outtage happened–so that I could figure out if it indeed had anything to do with my phone predicament. He went on again about cables and numbers and the color of water. Friday, I received a knock on the door and saw the AT&T truck parked in front of my house. I opened the door and greated Tom the Technician with a huge smile. Tom told me that my phone wasn’t working because he could see that the phone line was down. Tom fixed my phone line. Tom connected my phone and internet. Tom made sure it was working before he left. Tom is invited for dinner next week.